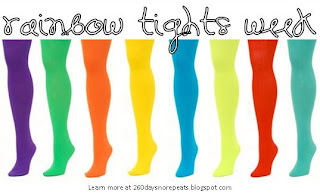 Welcome to Rainbow Tights Week, which became dangerously close to becoming little black skirt week. As you know, I have to plan out all my outfits for the week in advance so I can photograph them while the sun is up. This weekend I pulled out each pair of colored tights I was going to be wearing and started building my outfits around them. This week also happens to be the final week of the No Repeats Challenge, and I was beginning to find not repeating a challenge. The result ended up being day after day of black skirts (and a dress). I saw the five outfits sitting there and thought "Oh no! I can't wear black skirts all week! That would be such a cop-out and everyone would waggle their fingers in disappointment." I made a few swaps, a few overhauls, and have eliminated most of the black skirts (and the dress). I did think it was pretty interesting, how after a month of not repeating, I still had enough black to wear for a week. I've now decided on a 2011 rule, No Buying Black Skirts! Clearly I have enough, with the a-line, pencil, mini, tulip, and lace skirts already in my closet. This swap was black for brown and tan. Maybe it lacks the drama of black, white and red, but everyone has done it, so why not be a little different? Here is Me not realizing just how deep that snow drift happened to be. Go ahead and laugh, that's why I posted it. Do head over to 260 Days No Repeats and see how Iris is wearing her red tights today! I think I prefer the tan skirt to a black or brown one. I need more tan things in my wardrobe...like you, I have A LOT of black and it really gets boring after a while! Love your scarf, too! I'm obsessed with tights ATM; I plan on buying one pair in every color, and this is definitely an inspiration! Nice job mixing in another color instead of black - I would have went for the easy option and wouldn't have looked as cute as you! the brown and red is striking! I love that last photo!! It is nice to see you being so REAL!! HAHA!! I love the tan skirt pick too! I want more camel this year but I always seem to go back to black and grey. How boring!! Loving the red tights with it too!! 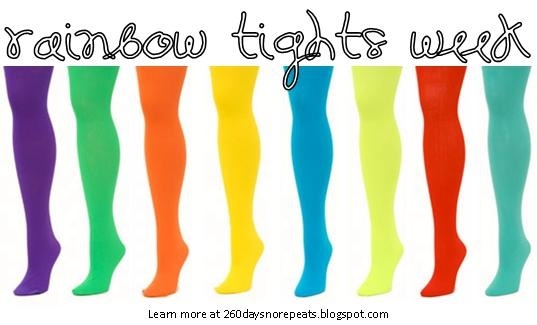 Yay for Rainbow Tights Week. I like how you paired red with this very neutral colored skirt. I would have never thought to pair the two but it looks great. I love everything about this look-that blazer is killer on you! And yes-the tights? Amazing! great mix! love the red tights! Love the furry cowl and the bright tights of course! Ah, I totally didn't know you planned your outfits ahead of time. NOW I KNOW YOUR SECRET MWAHHAHAHAHAHAHAHAHAH. Okay. Not a big deal at all. So yeah. Bu tI LOVE THIS LOOK. The brown definitely works well with the red; I agree, b+w+red has certainly been done before. I'm ecstatic to see all your posts! As you likely can guess, Rainbow tights are my favvvvv. Your booties are too too cute! Wow, you DO own a lot of black! That's a cool take-away from No Repeats. I really like this outfit with the red tights! Red and tan look so nice together, and I like the red hat topping it all off. Kudos on challenging yourself (and doing so well!) I love this dress so SO much, it's beautiful on you. Great boots as well! gorgeous outfit! i love the spark of the red tights. I sort of love that your post title is a shoutout to the Decemberists song. Lovely tights - this is so cheerful. I need to take a cue from you. bright colors may make the cold and gloomy a little bit easier to deal with! I like it with tan! The red almost becomes a neutral... if that makes any sense at all... Anyway, very cool, I love it! you look so cute! a pretty snow bunny. Your photographs are becoming so amazing. Look at your comments!!! Your fashions, the settings . . . so beautiful. Wow love the scarf, so chic! Hotness on the colored tights and entire ensemble. I hear ya on the black skirts and am so glad you included the one you're wearing. That outfit is seriously gorge and your pics are insanely fantastic!! I love the red with the brown. So unexpected! Awww you look adorable! I think you look fabulous in that 3rd picture!! This is so amazing! :-) You look so great. LOVEDDDDDD the color scheme here, you did an amazing job. I have to say your pictures are so pretty I almost wish it would snow... ok maybe not. My first instinct would have been to pair those bright tights with a black dress so I totally know what you mean - but the brown shades are unexpected and they look really fabulous! I've been seeing red tights all over lately and now I think I must have them! Your post title has that song by the Decemberists running through my head. ps. Thanks for the photo tips the other day! You look so cute. I love the silhouette and how you braved the cold and snow just for blog pics! I'm definitely being a wuss about it all. That cowl is amazing. I love your outfit Lydia! 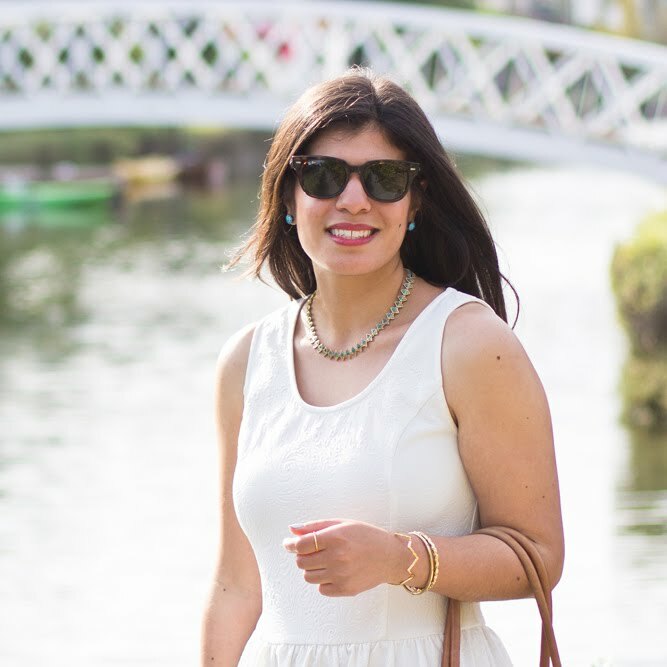 I hope you check my blog this week too! Love the colours you've chosen. I've been to start with brown swatches this year too! I have always been a black palette person. Those red tights are pretty! And love, love, love the NY&Co. fur wrap! You plan your outfits a week ahead? You go girl! I cant even plan my outfit for tomorrow, haha. The way this dress drapes is quite pretty! interesting outfit.. it looks very fresh :) and the setting is to die for.. I don't know why but it looks very Twin Peaks-y to me.. Wish we could have that kind of a setting in here..